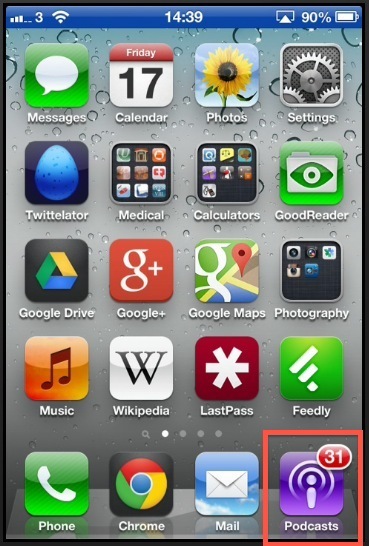 I’ve tried to include links to all the different apps, sites and resources mentioned during the workshop. I prepared this in advance so hopefully I’ll get a chance to update it somewhat following the workshop if people had good suggestions. Of note I have no financial relationship with any of the sites or apps mentioned here. Firstly we got everyone to join Twitter. You access twitter via the website or via an app on your computer or phone. For interest sake I use TweetDeck through Chrome on my computer and use Twittelator Pro on my iPhone. I use Tweedle on android. There are lots of different apps available that allow you to access twitter so feel free to experiment a little but I find these ones useful. I suggested that when you join twitter you should put a little of biographical information about yourself. People are more likely to interact with you if they know something about you. There are a lot of fake, spam Twitter accounts and having some info on someone helps people to trust you. I think it’s worth describing whether you’re a trainee or a fully trained physician on here too. The more interact, post and reply to people, the better your twitter experience will be. We don’t bite honestly, we loved being asked questions on Twitter. Hashtags [words beginning with the ‘#’ symbol] are good ways to join conversations together. My favourite hashtag is #FOAMed, this is a consistent conversation about FOAM resources. 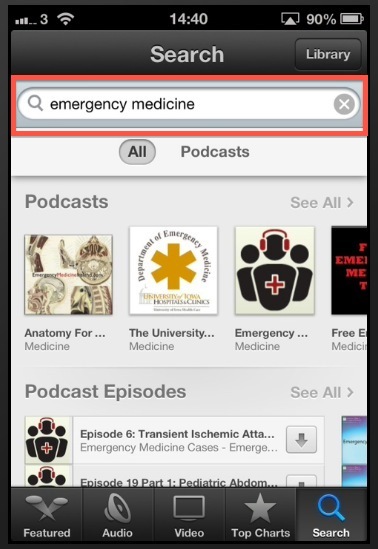 You can type #FOAMed into the twitter website or onto your twitter app to find it. 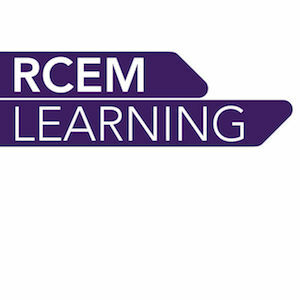 Of note there is also a #FOAMcc stream for more critical care topics and #FOAMped stream for kiddies. Or rather it’s about paeds EM, it’s not really for kids to read…. that would be just silly. NB, on a mac the # symbol is produced by pressing the ‘option/alt’ key and ’3′ together. I think the key is to get your podcasts on your smartphone. That way wherever you are yo can listen to them. It’s much more important to have them on your phone your computer in that sense. I suggest turing off podcast sync between itunes on your computer and your phone. You’ll only really use them on your phone anyhow. The basic ‘podcasts‘ app from apple on the iphone is a reasonable place to start.Downcast is a great alternative. Once downloaded, start the app and click the ‘store’ button. Once you’re in the store, search for whatever it is you’re interested in. 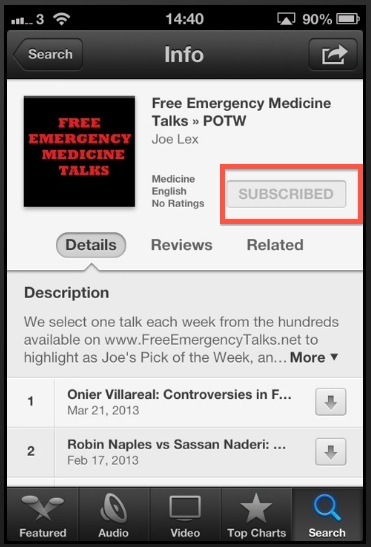 Once you find a podcast you want to subscribe too, just click on the subscribe button. Every time a new podcast is released it should download automatically to your phone. 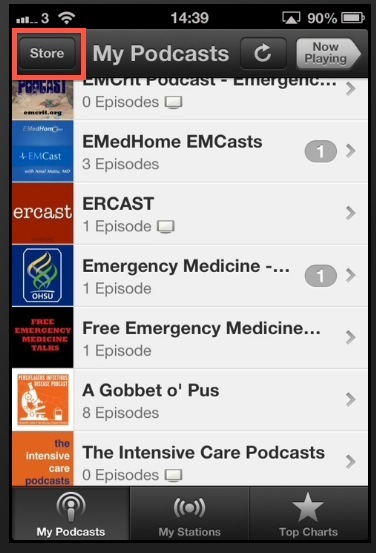 LITFL have a great list of podcasts and a searchable database too, if you need to find more. Most of the FOAM websites produce new material on a regular basis. 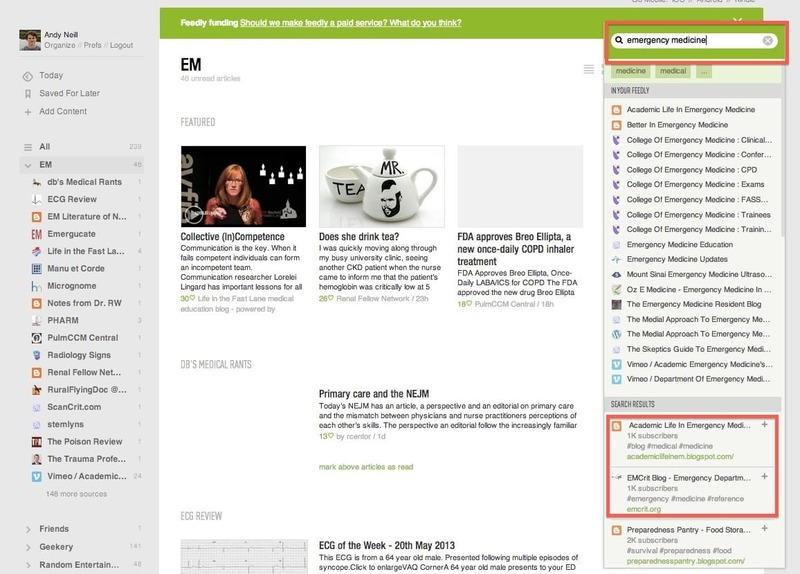 To save you having to visit the site to check if new amterial has been released, you can use something called a feed reader that will collect all the new material from all your favourite websites in one place. 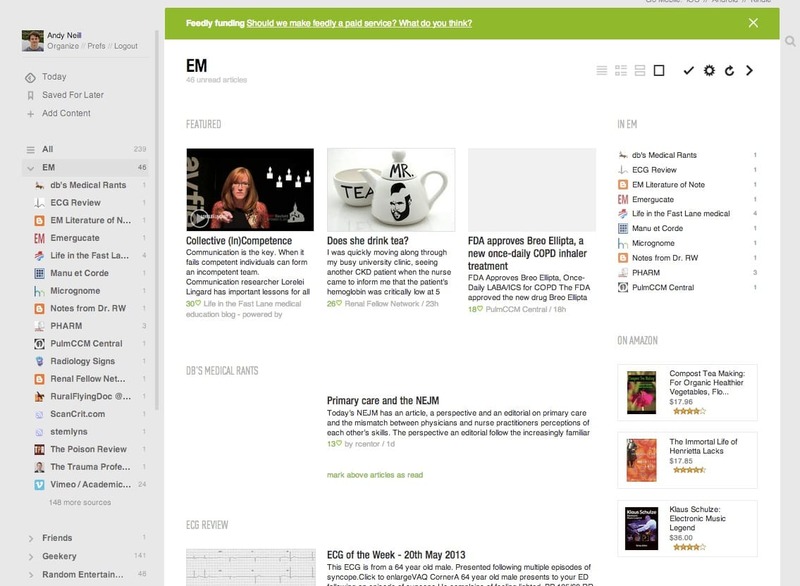 I used to recommend Google Reader but it’s shutting down in July 2013 and I’m now suggesting feedly as a good alternative. The mobile app is kept in sync with your computer and is set out in a similar easy to use way. If you’re looking for one place to look for all the best in FOAM then check out Kane Guthrie’s LITFL review. This site is like google but for FOAMed resources. If someone has written on a topic you’re interested in it should be searchable in here. Sometimes journal articles can turn up in your search a bit too often but other than that it works pretty well. This site reposts every blog published in the FOAMed world. It’s unfiltered so if you just want EMCrit’s feed and not Life in the Fast Lane then this isn’t for you. But if you just want to browse and see what’s recently published then it’s great. So say you’re keen to start putting out your own FOAM material, then starting a blog is a good way to start. Here’s the website we set up at the workshop in 15 minutes. This is what the ‘dashboard’; the construction site of the website looks like. This is all free and easy to do via wordpress. 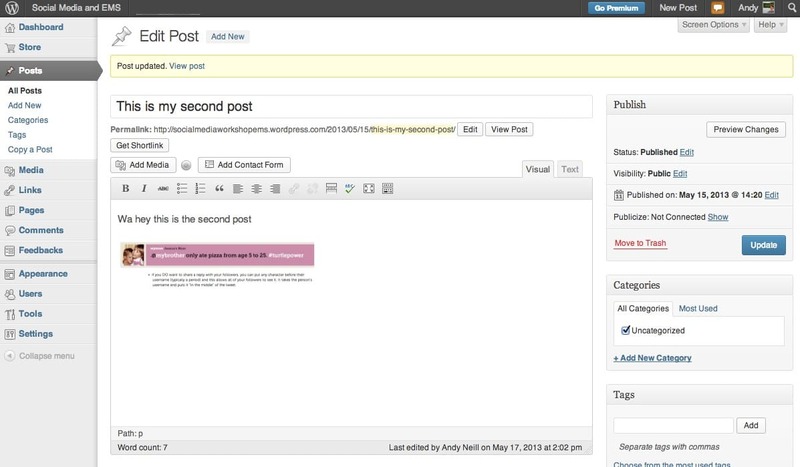 I would strongly encourage you to get a wordpress account and fiddle around with it. Here’s an example of a website I made in 15 mins during the last EMS Gathering workshop just to show how easy it is. We only mentioned this briefly but I said I thought it was a brilliant platform for FOAMed but unfortunately under utilised. 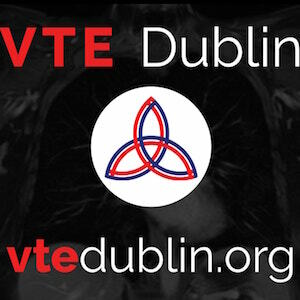 Its best features are probable communities [check outECG+ and the EMCrit community] and the google hangouts. Here’s a nice example of google hangouts being used to stream a conference live. Or here as a conversation between experts discussing some medical papers. Saves all the hassle (but not quite as much fun) of actually meeting up. Google plus does the cool thing of recording these video calls for you and storing them as a (private) YouTube video that you can then post on whatever website you want. A screencast is typically a recording of what’s on your screen with a voice over. It’s a great way to share a lecture you’ve prepared with lots of other people. Once the video file is made you can upload it to YouTube, Vimeo or even better GMEP for other people to see. Screenr.com let you record screencasts without having to download a separate app but I do a fair bit of this so I use one called screenflow. 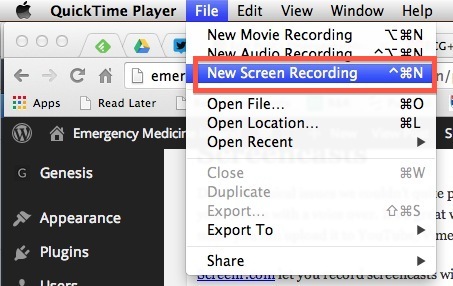 If you have a mac you can do this very easily by using quicktime on your mac. It comes free bundled with the operating software. At the end just press stop (there’ll be a stop symbol at the top of your screen) and then you’ll have a nice little video file of your screencast. Upload this to YouTube, put the link on Twitter and Robert is indeed your Mother’s Brother. This is tricky and I in no way pretend to be an expert on it. The one thing we have in our favour in the #FOAMed world is that we’re doing it for free. Everything gets a lot more tricky when you’re trying to make money on it. That doesn’t mean that you can simply do whatever you want just cause you’re not charging. There is a real possibility that you might piss someone else by using their material without paying or without credit. Everything I write I label as creative commons. This is an online movement to enable appropriate reuse and attribution of online resources. In general, creative commons resources can be used and modified freely as long as you 1) do not charge, 2) credit the original author. As I showed at the workshop, google have a nice search option for images labelled for non commercial re use. I use this extensively. Flickr has a similar service. There are lots of great videos online. If you need to get one for use in a presentation then there’s a site called SaveDeo that will create a video file that you can download and put in your presentation. Directions for creating an ad-hoc network on a Mac computer. Go up to the WiFi symbol on the taskbar on the desktop or laptop. Pick “Create Network” and you get the “Create a computer-to-computer” network box. Below are the slides from the PK talk I gave prior to the workshop.